Cut large scallops in half horizontally to make 2 rounds. Place two basil or sage leaves on top of each scallop. Stretch the bacon with the back of a knife and wrap each bacon strip around one scallop, then wrap a second if used across the first, to enclose the scallop. 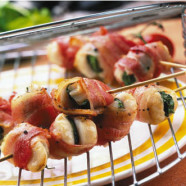 Thread each scallop onto 2 pre-soaked wooden skewers, brush with the garlic or herb flavoured oil and place onto a prepared foil-lined barbecue or grill, or griddle pan placed directly onto the barbecue. Cook for 1-2 minutes, turning once and serve immediately.